Useful if your homes water pressure is dangerously high. Series P60 Miniature Plastic Water Pressure Regulators are used in general purpose and OEM applications to regulate the pressure in systems that require a constant downstream and accurate flow performance. It consists of a thermoplastic body construction with ¼" NPT female connections in a straight through or 90° inlet to outlet design, all external components of NSF approved thermoplastics, all internal rubber components (disc, diaphragm, and seals) of FDA grade elastomers, all internal metal components of 300 Series stainless steel, and a bottom clean-out plug for service. Series P60 is compact and lightweight with a high flow capacity. It is also suitable for deionized water applications. Note, the nuts filling unused ports (and the pressure regulator itself) are soft, and the flathead screwdriver port plugs are shallow -- care must be take when working of you'll strip the heads. I ended up using my leatherman jaws to manually tweak the pressure. Also -- note, it does not come w/ any murlock fittings out of the box -- that's an extra order you'll need to make. My house water pressure measures 120! So I was having issues with my RO/DI unit leaking from the high pressure. I installed this bad boy and tuned it down to be 70PSI. It works well. My only complaint is you have to use pliers to adjust the pressure. Past that it is perfect! I didn't want change my homes water pressure. This product allowed me to lower PSI for my RODI system between 75 and 80 psi. I recommend testing the line you want to use for your RODI that way will know if you need this water pressure regulator or a booster pump. If your water pressure is over 90 psi buy this product. So before you buy an RODI system test your water pressure first. I would buy another just incase. I had no real issue with this except the fittings I got from Lowes the threaded part was to long to seat properly and had to go to a Local Hardware store to find shorter ones now it works great, I needed this because I live in a Small town surrounded by a larger city but we have our own water supply that is gravity fed 4-5 PSI max so I had to install a whole home booster pump that shuts off at 100-110 PSI I set the regulator at 60 PSI to protect the RO system I purchased here! even if I could control the pumps computer shut off PSI (They Forgot that feature) I would still use this as a redundant protection. The pressure in my old house was 105 psi and my RO will only handle 90 . It dropped the pressure with a very easy adjustment and kept the adjustment The whole time I needed it . I never needed to fuss with it.Great Product!! Works good, seems a little pricey, but a lot cheaper than having a plumber install a house pressure reducing valve! Very useful for reducing pressure on equipment that can't handle high static pressures, ie: RO/DI, Kalk reactors, etc.. Wish it had a pressure gauge built in to help with adjustments instead of having to get a separate gauge. Nice product, but wish it had a bit more flow through. Before installing this valve 100psi was the norm but now 50psi is all i can get, but it does make the system work good. The water pressure in my house is on average 70-75 psi, but at times I have seen the pressure on my RO gauge spike up to 100 psi. If I add this valve inline on my supply line to my RO unit will I be able to regulate the psi to a max of say the 70-75 psi not have my RO membranes be subjected to the excessive pressures? What would I need to go from 1/4" copper tubing to 1/4" plastic tubing? The reference to a 3/4" hose connection seems to be an error in the information. The input and output are 1/4" FNPT. Depending on your source plumbing size, you may need a reducing bushing thread x thread to convert to the 1/4" threads. 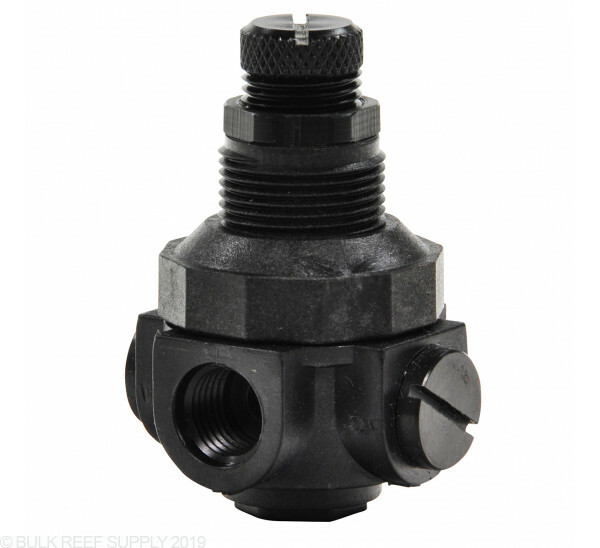 For the plastic tubing side, if you are using PEX or polyethylene tubing, you should just need a npt x push connect fitting. As of right now, my home water pressuer is at 30PSI, when I turn on my pressure pump, my pressure goes unto 90PSI, can I run a pressure reducer valve to reduce the pressuer of the pump? and if so, where inline do I add the pressure reducing valve, before or after the pump?. Thanks for getting in touch with us in regards to lowering the pressure on your water system. I would first check and see if there is a dial on the booster pump to allow for pressure adjustments. If not I would add in the Watts Pressure reducer after the pump in order to lower the pressure to around 70. Please let us know if there is anything else that we can assist with. Thanks!